Who says fractions are boring? With these cards enjoyment is guaranteed. 7 different games to play with the cards, so it doesn’t get boring. Skills learned: Concept of fractions, numerator and denominator, comparing two fractions. 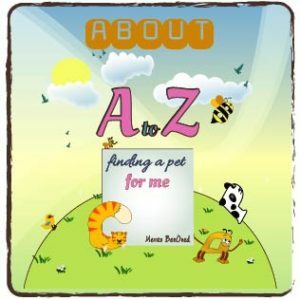 Just print the cards (2 times each page), laminate them , cut the cards, choose a game and play. Each player turns up a card at the same time and the player with the higher card takes both cards and puts them, face down, on the bottom of his stack. 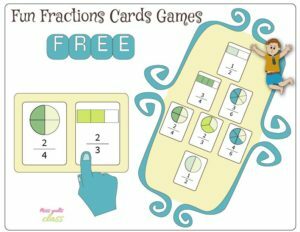 Note: Using bar fractions cards at the beginning will make it easier on the child to learn the fractions. Then you can use the pie cards and eventually mix them. This game is for advanced fraction students. Each player gets 7 cards. Keep your dominoes in front of you but hidden from your opponents. Open 1 card from the pile and start taking turns. The first player must then place a matching card next to the first card. A matching card is either a card with the same fraction color or a card with the same fraction value. For example, if the first card pulled from the pile is one half the first player can put 1 half, two half or anything with 1 half value like 2 quarters , 3 out of six and so on. If the player does not find a matching card he takes a card out of the pile. the first player to stay without cards wins. Put cards on the floor and ask the child to jump on each card with a value you decide on. For example ask him to jump on all the cards that equal a half. Put the cards on the floor , unorganized and as far apart as possible. Say: I spy a card that equal __ and the child runs to all the cards with that value until he/she finds the one you spied. Lay them in rows, face down. Take turns turning over any two cards. If the two cards match , keep them. The next player ask a question about the cards like what other options are there to get the same value: for example if the cards are 1/2 he can answer 2/4 0r 3/6 and so on. If the player answer correctly he gets another turn. If they don’t match, turn them back over. Try to remember what was on each card and where it was. Watch and remember during the other player’s turn. Take all the bar cards and divide between the players. Make a pile out of the pie fractions cards faced down. Pull the first card from the pile: each player get to pull out all the cards with the same value that he has. Keep puling cards. The player that is left without cards wins. Show cards with different denominator and numerator that equals 1 to explain bigger denominator means smaller pieces of the pie. Show cards with same denominator and different numerator to explain numerator affect. show to cards with a different numerator and denominator but with the same value like 1/2 and 2/4 and ask how to get from 1 to another: in the example its multiplying by two. Finally: in a few days I will post another fun fractions game with the cards so stay tuned :-). Which game your kid loved most? let me know in the comments section. A picture of you and your kid playing will make us really happy. If you have more ideas to play with the cards we would love to hear them too. 1 Pings/Trackbacks for "Second Grade Math: Fun Fractions Games"